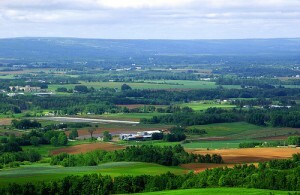 A stunning view from The Lookoff, on Route 358 near Blomidon in the Annapolis Valley. Lined with pretty towns and villages, historic museums, apple orchards, wineries and whale-watching opportunities, the historic Annapolis Valley is a delight for visitors. The northern end of the 150km long valley is easily reached as part of a day trip from Halifax, including the lively university town of Wolfville and the hike out to Cape Split in Cape Blomidon Provincial Park but you should have at least 2-3 days to do the area justice. There’s so much to see and do that it’s best to decide ahead of time what you’d most like to experience. As for accommodation, unless you’re traveling during peak summer weekends or have your heart set on a particular place, you can just show up and see what’s available. Charming B&Bs are all over the region. If it’s food you’re after, then head straight for Halls Harbour on the Bay of Fundy, for lobster cooked fresh off the wharf. Halls Harbour is also one of the best places to see the extreme Bay of Fundy tides at work. Wash down your lunch with a bit of wine in Grand-Pré and take in the Acadian historic site while you’re there before heading off to Digby to sample the local scallops. History buffs will want to stop first at Grand-Pré before continuing further south to historic Annapolis Royal and its star attraction Fort Anne and nearby Port Royal. On your way there, don’t miss the artistic enclave of Bear River with its colourful houses, rich Mi’kmaw heritage and a wealth of local craftspeople. Some of Nova Scotia’s best wildlife spotting opportunities are also nestled in this corner of the province. There are few better places to go whale-watching than on Long Island and Brier Island, set at the tip of the the narrow peninsula of land known as Digby Neck that juts out into the Bay of Fundy. You might also see other marine and birdlife like porpoises and puffins. For more outdoor fun, go camping, walking, kayaking or swimming in Kejimkujik National Park, set just inland from the main part of the valley. No matter where you go, make sure to taste some of the bounty that’s grown in this part of Nova Scotia. 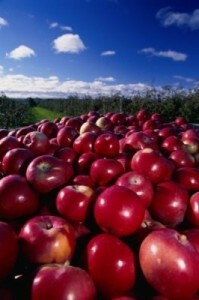 Crunchy apples have long been the area’s most famous export and from late May the landscape explodes with apple blossoms. It’s a good excuse for a party so every spring there’s an Apple Blossom Festival. This is one time when you should definitely call ahead to book a room for the night.